Durban, South Africa: South Africa beat Pakistan by five wickets on Tuesday to level the one-day series at 1-1 as Andile Phehlukwayo gave a compelling argument to be the Proteas' allrounder at this year's Cricket World Cup. 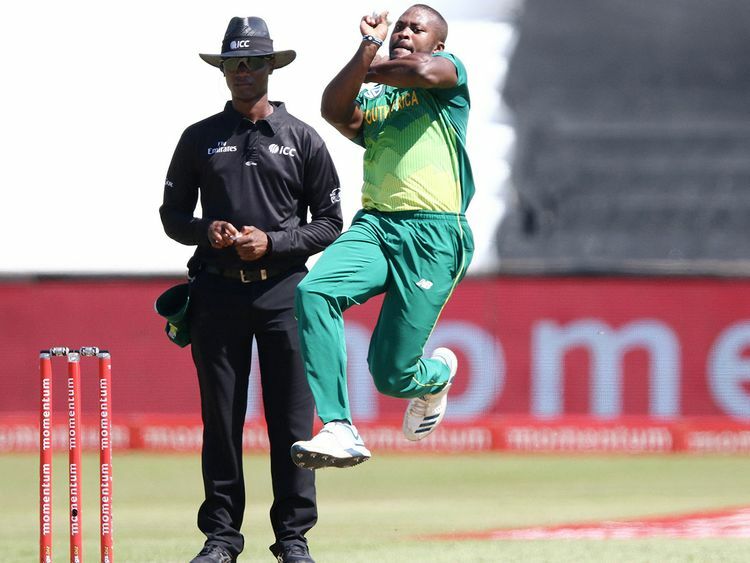 Phehlukwayo took career-best figures of 4-22 with the ball to help limit Pakistan to 203 all out. He then hit a career-best 69 not out with the bat to lead South Africa to 207-5 in 42 overs and victory after the home team was in deep trouble at 80-5 in its chase. Phehlukwayo shared an unbeaten partnership under pressure of 127 with Rassie van der Dussen, who was assured for his 80 not out to continue his brilliant start to his one-day career. Van der Dussen made 93 in the first ODI, his debut, although Pakistan won the series-opener. South Africa should have won Tuesday's second game more comfortably after Pakistan was 112-8 having been put in to bat at Kingsmead. Pakistan salvaged a reasonably competitive score thanks to No. 10 Hasan Ali's counterattack of 59 off 45 balls. The tailender smashed five fours and three sixes and was backed up by captain Sarfraz Ahmed's 41. They were the last two Pakistan batsmen out, both falling to Phehlukwayo after putting on 90 for the ninth wicket. Defending a meager total, Pakistan roared back into the game when 18-year-old fast bowler Shaheen Afridi removed Hashim Amla, Reeza Hendricks and captain Faf du Plessis quickly to have South Africa struggling at 29-3 in the first six overs. Afridi bowled Amla with a fast inswinger and beat Hendricks and du Plessis to have them caught behind. Phehlukwayo's position in the team has been up for debate but he made sure it was his best performance for his country with a match-winning half-century. The 22-year-old allrounder lived dangerously, surviving a couple of edges and near-misses. But he still played with adventure, hitting reverse sweeps regularly off spinner Shadab Khan and launching two big sixes down the ground to go with his seven fours.